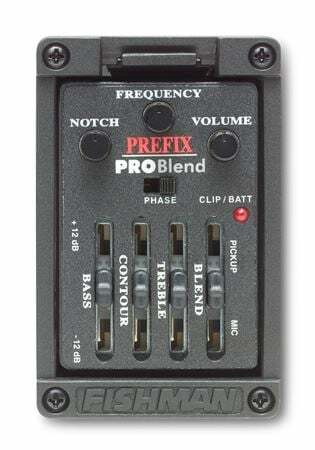 Order your Fishman Prefix Pro Blend Pickup System Narrow Format from AMS and enjoy 0% Interest Payment Plans, Free Shipping, Free Extended Warranty & 45 Day Money Back Guarantee. Upgrade your electronics to Fishman, the best name in acoustic electronics. Ideal for smaller body guitars, this system packs features similar to the Prefix Plus series, on a smaller bezel that occupies 1/3 less space on the guitar — an excellent fit on slim-bodied acoustic-electrics.